The Hidden Tower is a shop of enchanted artifacts and powerful weapons, run by the Faerie Queen herself. It stocks the most expensive merchandise in Neopia, which only the richest Neopians can afford. The Hidden Tower has several features that make it so exclusive. In addition to having the requisite millions of Neopoints to make a purchase, you may only visit the Tower if the shop is open, if your account is old enough, and if you know where to find Neopia's most famous invisible landmark. You may only purchase items from the Hidden Tower if your account is at least four months old. You may only purchase one item every 24 hours. If you try to buy another item within 24 hours of your last purchase, you will receive this message: "Error: Sorry, I will only sell one item to you every 24 hours, I don't want to run out of stock!" Unlike other shops, clicking on an item means you agree to pay the listed price. Although you can't haggle, there are two opportunities to receive a discount in the Hidden Tower. You may not use both discounts at the same time. If your account is over 60 months old, you can visit the tower on the third Wednesday of each month to receive a 3% discount on any item. Jellyneo posts a banner every third of the month to alert you. Sometimes the discounted prices are not the best prices out there—and sometimes they are! For a full rundown of all the Hidden Tower items currently for sale and their market prices, see our Hidden Tower Price Guide in the Item Database. You could never afford any of these. The Hidden Tower differs from other Neopian shops in that there is an unlimited quantity of each item available. There is no haggling; the price listed is fixed. Occasionally Fyora stocks new items, and retires others. Once an item is retired from the Hidden Tower, no more will ever enter the Neopian economy, making them limited and rare. You can find a complete list of Hidden Tower items, past and present, in our Item Database. There is no inspecting the merchandise. Accordingly, unlike in other shops, there is no hovertext showing the description of each item. If you click on an item, you will immediately purchase it (assuming you have enough Neopoints on hand). 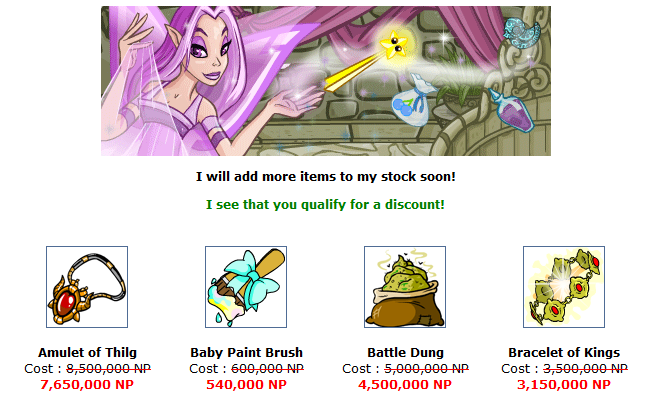 However, like many expensive things in real life, some Hidden Tower items aren't worth their million-Neopoint price tag. For example, the 800,000-NP Ilere Faerie Doll will make your pet no more happy than a 1-NP Diseased Mechafish will. Similarly, the quality of Battledome weapons sold in the Hidden Tower range from exceptional to merely adequate to questionable at best. There are several items in the Tower that serve special purposes; here are just a few. 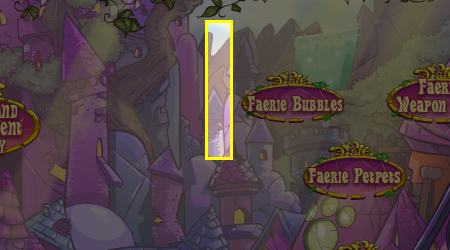 Purchasing any item from the Hidden Tower will earn you the Fyora - Faerie Queen avatar. 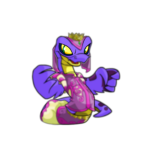 To acquire the Queen Fyora avatar, you must allow your pet to play with the Faerie Queen Doll. Please note: you won't get the avatar by playing with the Supreme Deluxe Faerie Queen Doll, which is twice the price. You can buy or borrow the doll from other players on the site, but you'll usually need to exchange Neopoints or items as collateral. The HT - Rich, HT Richer, and HT Richest avatars are only available by having your pet read the Grimoire of the First Order, Grimoire of Prosperity, and Grimoire of Affluence respectively. These items are no-trade and cannot be purchased from or sold to any player. Finally, the I Taunt the Pant Devil avatar requires refreshing your inventory while you have items with a combined estimated value ("Est. value") of over 5,000,000 NP. Although Hidden Tower items are not required for this avatar, the Hidden Tower does contain a number of items whose individual estimated value exceeds five million. For example, the Hubrid Nox Memorial Shield alone has an estimated value of 8,200,000. A single such item allows you to stuff your inventory with 49 Pant Devil Attractors, a wise defence when attempting to earn this avatar. For the true avatar collector, we're well worth the price! 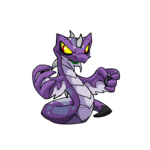 Four paint brushes for your Neopet are currently available in the Hidden Tower: Royal, Baby, Darigan, and Maractite. Paint brushes are magical items that can be used to paint your pet a different colour. For example, here's how the Hissi looks when painted these colours. For other species, click on the paintbrush or visit Jellyneo's Rainbow Pool. Because the Hidden Tower is the only place you can buy these paint brushes, their prices will be fairly consistent even if you find them in the Trading Post. The Baby Paint Brush in particular, because it is considered in demand and easily sold, has become a de facto scrip on the Trading Post. 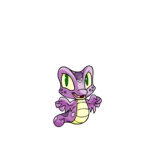 Also keep in mind that you cannot paint your Neopet Royal via the Lab Ray or Fountain Faerie Quests. There are some Royal Morphing Potions, but it may be cheaper just to buy the brush. Petpets can also get the Royal treatment with the Royal Petpet Paint Brush. You can see which petpets are available in the Royal colour by visiting the Petpet Colours Page. Battledome items available from the Hidden Tower range widely in quality, but they do include some of the best weapons readily available. While many Hidden Tower weapons in the past were less than spectacular, especially given their high price tag, the current stock includes some exceptional items. along with several other powerful weapons. Visit Jellyneo's in-Depth Battlepedia for a complete list of Hidden Tower Battledome items, including descriptions and ratings for each item. Our iDB staff have also compiled a list of the Hidden Tower's most recommended items for battling. 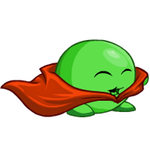 Finally, special mention must be made of a truly unique wearable item, the Super Pea Chia Cape, exclusively for Pea Chias, and currently the only piece of clothing ever designed for any fruit or vegetable Chia. The existence of the Hidden Tower was first announced on January 16, 2001 (Y3), and officially opened the following day, January 17. The Hidden Tower is usually portrayed as invisible, or at least highly magically camouflaged, from the outside, but a classic stone tower from the inside. The shape-changing Aisha Myriad, now retired from the Hidden Tower, was created by Captain Xelqued, an Alien Aisha, stealing Queen Fyora's most valuable secrets from the Hidden Tower right under her nose. This bold incident of industrial espionage earned an entry in the Neopedia. The inherent danger of an invisible tower in a busy city, especially in a world where many of the residents fly, has led to a common trope in which unsuspecting Neopets careen headlong into the tower's stone walls. Buy anything from the Hidden Tower. Purchase the book Grimoire of the First Order at the Hidden Tower and then read the book to your pet. Purchase the book Grimoire of Prosperity at the Hidden Tower and then read the book to your pet. Purchase the book Grimoire of Affluence at the Hidden Tower and then read the book to your pet.